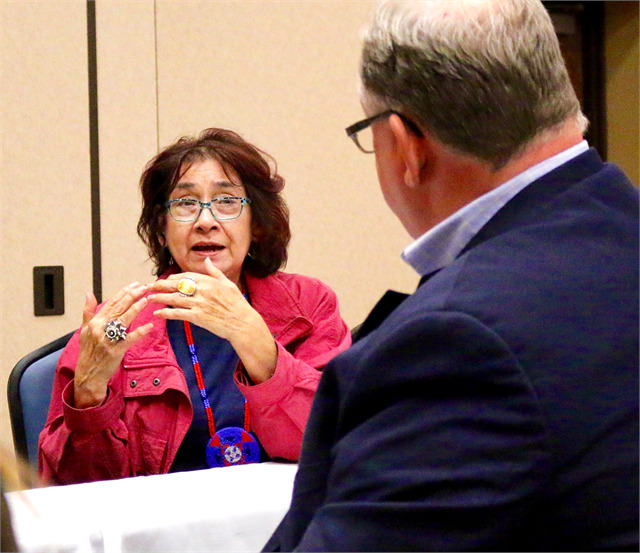 Tribal elder Faith Smith speaks to Society Director Christian Øverland during the first American Indian engagement session with the Lac Courte Oreilles Band of Ojibwe in Hayward. 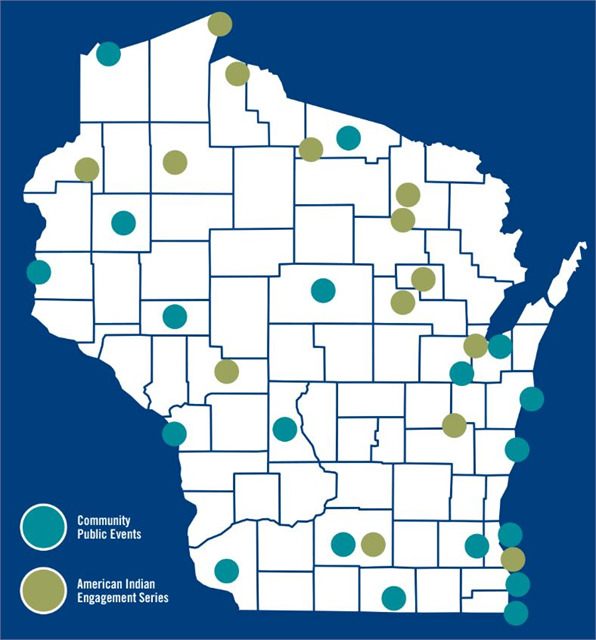 HAYWARD — The first of the Wisconsin Historical Society's new museum engagement and listening sessions planned for the 12 American Indian nations of Wisconsin — titled "Walking Together in a Good Way: American Indian Engagement for the New Museum Project and Beyond" — was held Oct. 2, 2018 with the Lac Courte Oreilles Band of Ojibwe at the tribe's Sevenwinds Casino, Lodge & Conference Center. Christian Øverland, the Ruth and Hartley Barker Director of the Wisconsin Historical Society, and Rebecca Comfort, the Society's American Indian Nation Liaison, had a good discussion with Tribal Chairman Louis Taylor and Vice Chair Jason Schlender before the evening event with tribal members, which produced meaningful personal conversations. Guests shared their experiences growing up on the reservation and other stories of tribal life. One tribal elder woman talked about learning the skill of ricing from her mother and grandmother, and how she now teaches it to younger tribal members. Øverland used that experience to share a new museum rendering showing how digital technology will allow live programming to be broadcast from the museum to locations around the state, and vice versa. He asked the audience to imagine the possibility of the woman demonstrating authentic wild ricing techniques inside the large conference room in which the event was held, and broadcasting it to people across the state. Meaningful and ongoing conversations like that are what the statewide engagement tour is all about, Øverland said. 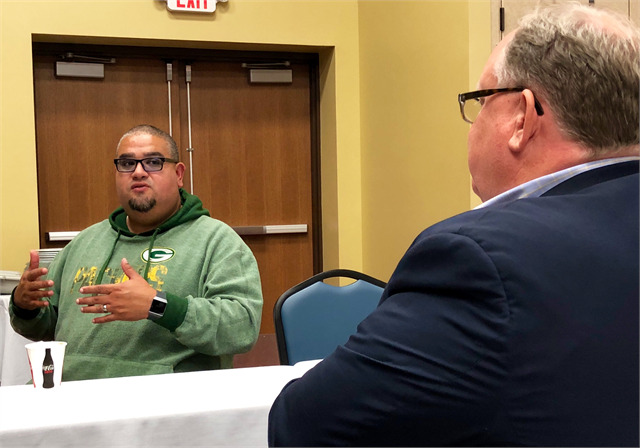 Jason Schlender, Vice Chair of the Lac Courte Oreilles Tribal Governing Board, shares stories of his tribe's history during the new museum engagement session in Hayward. 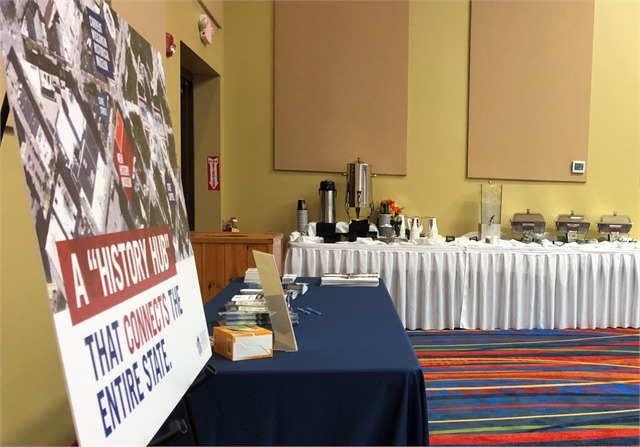 The first of the Society's new museum engagement sessions planned with each of the 12 American Indian nations of Wisconsin was held Oct. 2 with the Lac Courte Oreilles Band of Ojibwe at the tribe's Sevenwinds Casino, Lodge & Conference Center in Hayward.